Tuesday was a big day for you. That was the evening you finished up the antibiotic for your strep throat. It was also the night that things changed forever in your little world.During the day, I noticed that a binky you had was chewed through. I did not know where another one was and told you it was broken. Little did you know that I was preparing you for something big. When it was time for bed we told you your binky was "broken" and there were no others in the house. It was time and we knew you were ready. Much to my surprise, you only cried for a little while. When I was able to calm you down, I reminded you that it was your last binky and it was broken. You repeated the information back to me. I asked if you wanted your back patted to fall asleep. It took a while for you to quietly settle. For quite some time you simply looked at me and sulked. When you woke up in the morning you asked for your "baby" right away. We told you it was broken and all gone. You wimped, but with a little diversion you were good. Several more times you mentioned it. 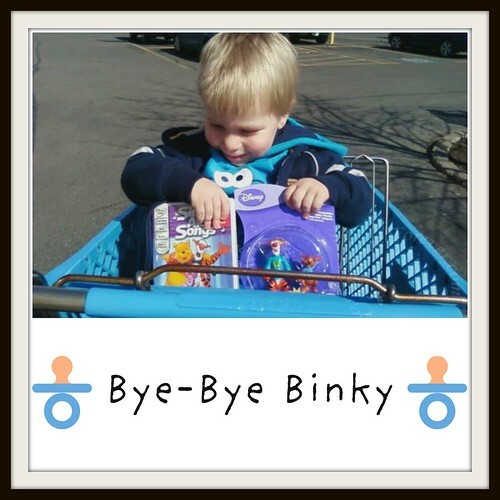 I asked you if you wanted to go to the toy store to get a bye-bye binky toy. You said yes. When I asked what you wanted, you told me a Winne the Pooh toy. Who knew that getting something with Winnie the Pooh would be so tricky? We went to four stores and then finally went to Toys R Us and found something. You were SO happy! When NHL got out of school you proudly showed him your bye-bye binky presents. Now of course, we are going to work on a bye-bye diapers! I know you are ready and I am willing to deal with more laundry if need be. You are growing up so quickly, but you will always be my baby. Hurray! I love it. We got a stash of potty presents. Again, I say hurray! I’m glad it wasn’t too painful. My first son wasn’t too bad about giving it up. We did something similar, the first night he went to sleep without on his own we just said it was lost and didn’t find it. Of course, the second son, wow, I’d almost like it if he took one! .-= killlashandra´s last blog ..Bundled =-.